We’re getting into the Christmas spirit at work. 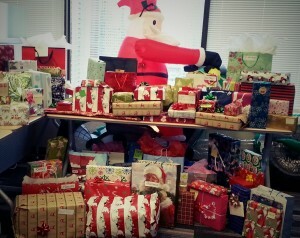 Our Secret Santa gift exchange is today, where we get a $10-$15 gift for the person as he or she was a child. After opening gifts, all the toys are donated to the CP24 CHUM Christmas Wish — such a fun and caring idea. The adults get to have fun picking out a gift for someone and opening a gift. Then the less fortunate children get to benefit with all the donated toys. It’s a win-win situation. This holiday season, please remember the kids that won’t have anything to open on Christmas day without donations. If you’re out shopping, drop off an unwrapped gift (big/small, inexpensive/costly…anything) at a toy drive. Or better yet, after your kids open all their gifts, instead of them keeping yet another piece of plastic, donate it for the following year. Just imagine the smile you’ll put on a child’s face. Since the popularity of Lululemon, yoga has become a huge trend. I can appreciate the fundamentals of yoga and I am impressed with those real and dedicated yogis, but I just can’t take the young, brand-name wearing yoga-class goers seriously. With some exceptions, like Hot Yoga, I say just do the stretching and meditating at home. Yesterday, however, I attended a prenatal yoga class. It was for one main purpose: to work out with other expecting mothers. I was so disappointed to see just one other woman there, and she is close to popping so she wont be attending much longer. The class itself was very similar to the workouts I do at home, so to me, without that extra socializing, attending regular classes wouldn’t be worth it. What did come out of the class for me was motivation. The instructor mentioned she has a 6-month old, yet her body looked strong and amazing! I’ve heard about these stories but this was right in front of me. It really can happen. She kept active during pregnancy so I guess her body bounced right back after delivering. Now, I’ll be realistic and not expect the same considering I’m not as active as I could be and I like my sweets, but seeing her results motivates me to at least keep up with what I’m doing. So, with trends aside, I do highly recommend prenatal yoga for pregnant women. Try out a class or a video. I mentioned Lindsay Brin in an earlier post. She has a more intensive “workout-like” yoga routine. Whereas, if you’re looking for a more traditional relaxation prenatal yoga, check out Shiva Rea.